SUBHEAD: Many real heroes and heroines may choose to engage in ways that are not scripted by any of the elites. 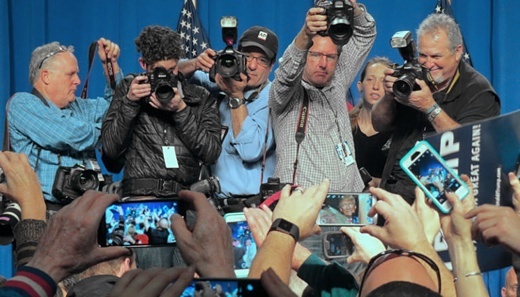 Image above: The media grabbing pictures of Trump. From original article. Behold today’s edition of Empire’s End—the biggest, best-ever 24/7 reality TV show! It’s been decades in preparation, with a budget in the trillions, a cast of billions! Its hero-villain is far more colorful and pathetic than Tony Soprano or Walter White. One day he and his team of oddball supporting characters appear to be winning bigly; the next, they’re crashing and burning. We’re all on the edges of our seats, alternately enraged, horrified, thrilled, or brought to tears in uncontrollable laughter. Who could bear to miss a minute of it? We are at the end of the period of general economic growth that characterized the post-WWII era. I’ve written extensively about this, and there’s no need to repeat myself at length here. Suffice it to say that we humans have harvested the world’s cheap and easy-to-exploit energy resources, and the energy that’s left will not, much longer, support the kind of consumer economy we’ve built. Further, in order to keep the party roaring, we’ve built up consumer and government debt levels to unsustainable extremes. We’ve also pumped hundreds of billions of tons of greenhouse gasses into the atmosphere and oceans, putting the entire biosphere at risk. Yet our current economic and political systems require further, endless growth in order to avert collapse. Almost no one wants to discuss this situation—neither politicians nor economists. Therefore the general public is left mostly in the dark. Still, everyone senses a change in the air: despite jiggered statistics, workers know that their wages have stagnated or fallen in recent years, and members of the younger generation generally expect to earn less that their parents. This generates a persistent low-level sense of fear and dissatisfaction, guaranteeing a significant political shift such as we are seeing. The new and current U.S. regime is adopting an essentially fascist character. When empires decline, people often turn to leaders perceived as strong, and who promise to return the nation to its former glory. In extreme instances, such leaders can be characterized as fascist—using the word in a generic sense to refer to authoritarian nationalism distinguished by one-party rule, the demonization of internal and external enemies (usually tinged with some form of racism or anti-Semitism), controls on press freedoms, and social conservatism. Here’s the thing: Once a nation turns decisively toward fascism, there’s rarely a turning back. Fascist regimes ruthlessly hobble and destroy all opposition. Typically, it takes a foreign invasion or a complete economic-political-social collapse to reset a national government that has gone fascist. Now, put these two premises together. Just defeat the fascists, no matter what the cost. But the end of growth ensures that, beyond a certain point, there will be no more “normal.” We’re headed into new territory no matter what. It’s possible that the Trumpist insurgency will succeed in rooting out or suppressing opposition not just in Congress and the media, but also in Executive-branch departments including the CIA and FBI. In that case we may see at least a few years of authoritarian national governance punctuated by worsening financial and environmental crises, all against the backdrop of accelerating national decline. It’s just a guess, but the regime may have only two more months to somehow overcome resistance within the intelligence community; if it can do so, then the task of undercutting the judiciary and the media can be pursued at a more leisurely pace over the next year or two. But thanks to Premise One, short-term success probably will not lead to a regime that is stable over the long term. Eventually, no matter how vigorously it suppresses real or perceived enemies, the U.S. federal government will collapse as a result of war, economic crisis, or the simple ongoing erosion of biophysical support systems. At that point a possible trajectory for the nation would be to break apart into smaller geographically defined political entities. However, the short-term success of the current regime is not yet guaranteed. It is still entirely possible that establishmentarian Democratic and Republican members of Congress, working with with renegade CIA and FBI mid-level officials and mainstream media outlets, could mire the new leadership in a scandal that is too deep to survive. Or, if Republicans lose control of Congress in 2018, articles of impeachment could be brought against Trump. This would not, however, guarantee a return to status quo politics in Washington. Not only does Premise One guarantee that the old status quo is no longer tenable, but also on its own terms the political system is now too broken and the nation too divided. In this scenario, pro-regime and anti-regime elites might just continue to escalate their attacks on one another until the whole system crashes—as I explained in a previous essay, citing the conclusions of ecologist Peter Turchin, which he based on his comparative study of over a dozen ancient and modern societies in analogous circumstances. It’s just a guess: if the regime is successful in the short term, we might get a slower crash; if it fails, we might get a faster one. In any case, there’s no national team to root for that is capable of restoring the status quo ante Trump, at least not for long, if that is even desirable. Under either scenario, competent local governance might provide significantly better living conditions than the national average (more on that below), but the overall picture is pretty grim. A few years from now I expect that we’ll be in very different territory socially, politically, and economically. This is not a conclusion that I relish, but it’s one seemingly demanded by history and logic. 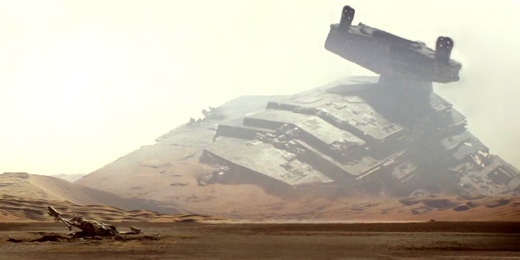 Image above: The Empire from Star Wars in defeat. From original article. While the legal and social functions of of liberal democracy persist, vigorous and sustained protest efforts could help rein in the fascist tendencies of the new American government. Participating in protests could enable you to get to know other members of your community. On the other hand, protest could further fragment your community if that community is already deeply divided politically—and it could eventually get you in a lot of trouble depending on how things work out, since protest under fascist regimes doesn’t produce the same result as protest in a liberal democracy. Don’t obey the new leaders when they call for actions that undermine democracy and justice; instead, choose to actively disobey in ways that actually matter in the long term. Refuse to define yourself in terms of the regime. Yes, at certain moments in history it is necessary to take a stand one way or the other on a particular issue (such as the issue of slavery in mid-nineteenth century America), and in the days ahead some issue may require you to plant your flag. But this historical moment may be one when many real heroes and heroines choose to engage in ways that are not scripted by any of the elites. Park City, Utah, is damned! Arctic Methane "May be apocalyptic"
See film "Okinawa: The Afterburn"
How big a deficit with Trump?